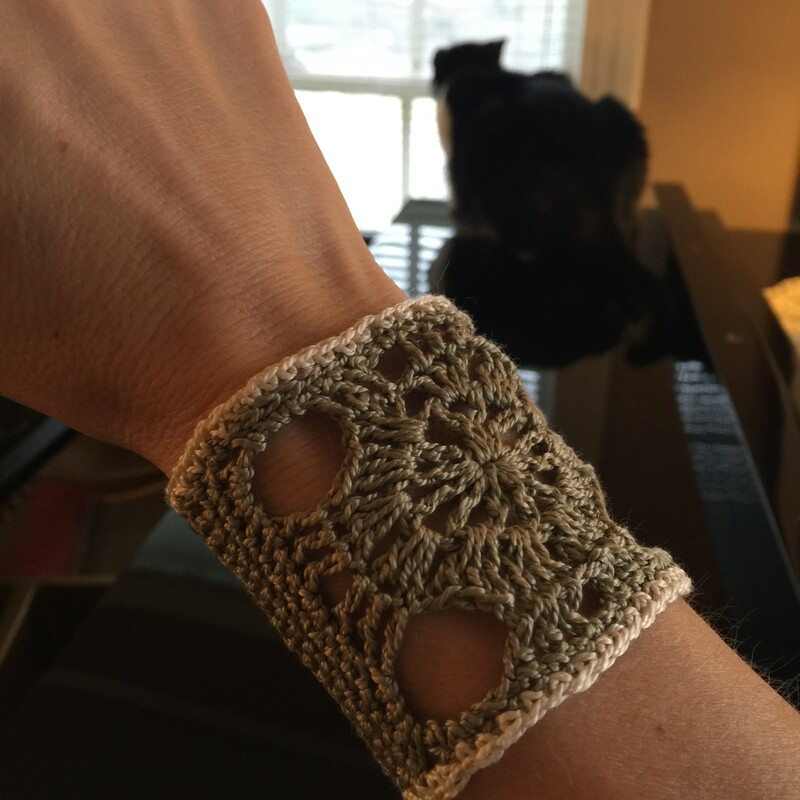 This weekend I revisited the Spokes Crochet Cuff I made in Oct0ber 2014 when I first started this blog. 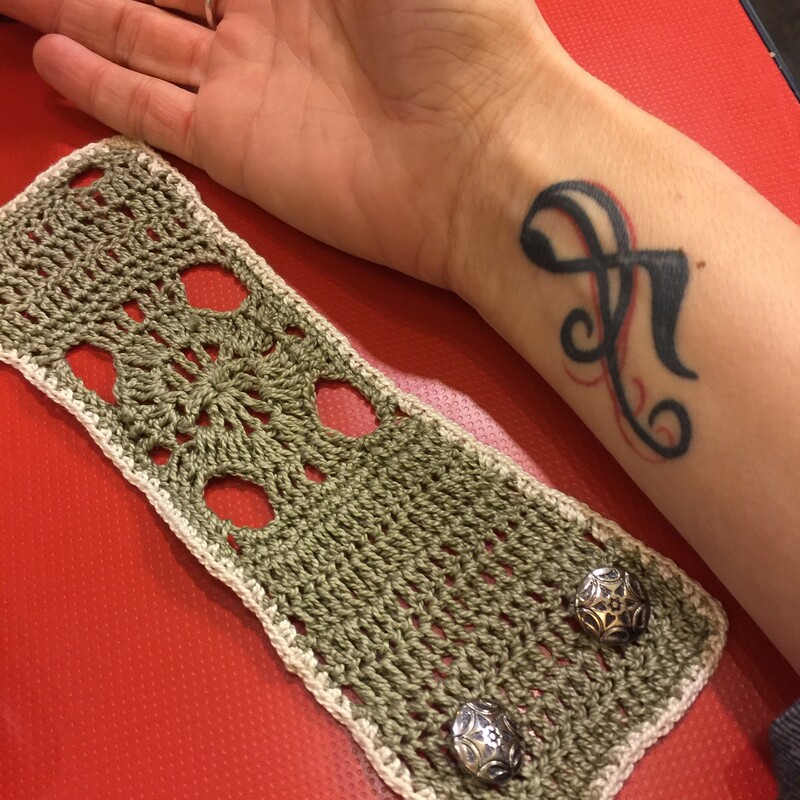 At the time I was looking for a tattoo wrist cover I could wear to a job that didn’t allow tattoos. As it was Fall and I was a seasonal associate, using wool yarn made sense and the three I made turned out great. I’ve worn them a lot and received many compliments too. Don’t get me wrong, I love my wrist tattoo. It reminds me of my love of music and there’s nothing wrong with that at all! 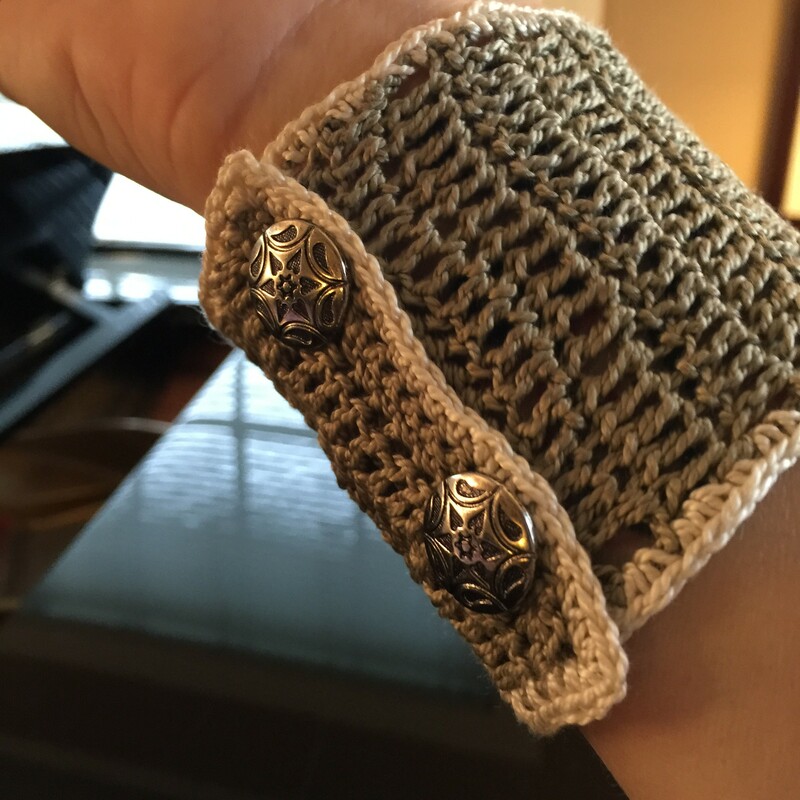 But there are times when I want to “hide” it and I also like the idea of covering it with something I made. 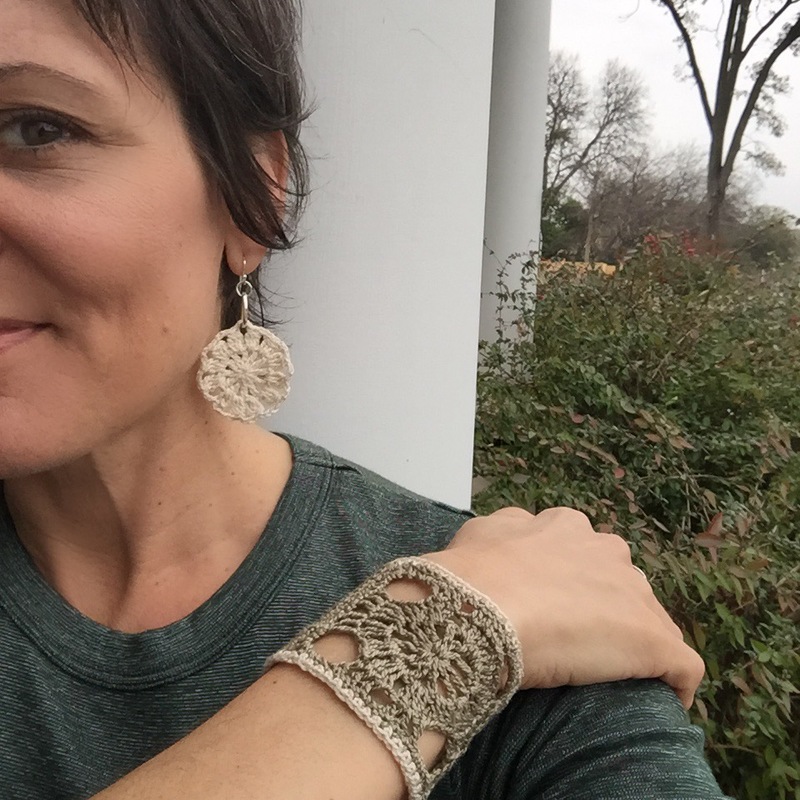 So this Spring I made a new cuff out of DMC cotton thread yarn in my favorite color — green! Well it’s more of an olive green. I love it too. I used DMC Pearl Cotton Thread Size 5 1 skein of each color. ($1.69 each). Olive Green (#3052) and Off White. The Spokes Crochet Cuff pattern is my Mercedes Tarasovich on Ravelry. DMC Cotton thread is the best! These earrings are super easy and fun to make. Just two rounds! Round 1: Chain 4. (Counts as first dc and ch 1), *dc, ch 1* 11 times for a total of 12 dc’s. 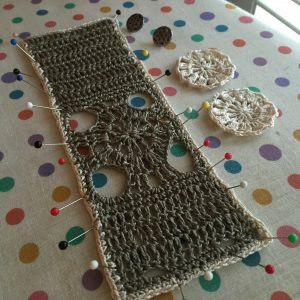 Join with a slip stitch into the first chain 3. Round 2: Chain 3, dc2tog in the same space, ch 3, *dc3tog in the next ch1 space, ch3*. Repeat. 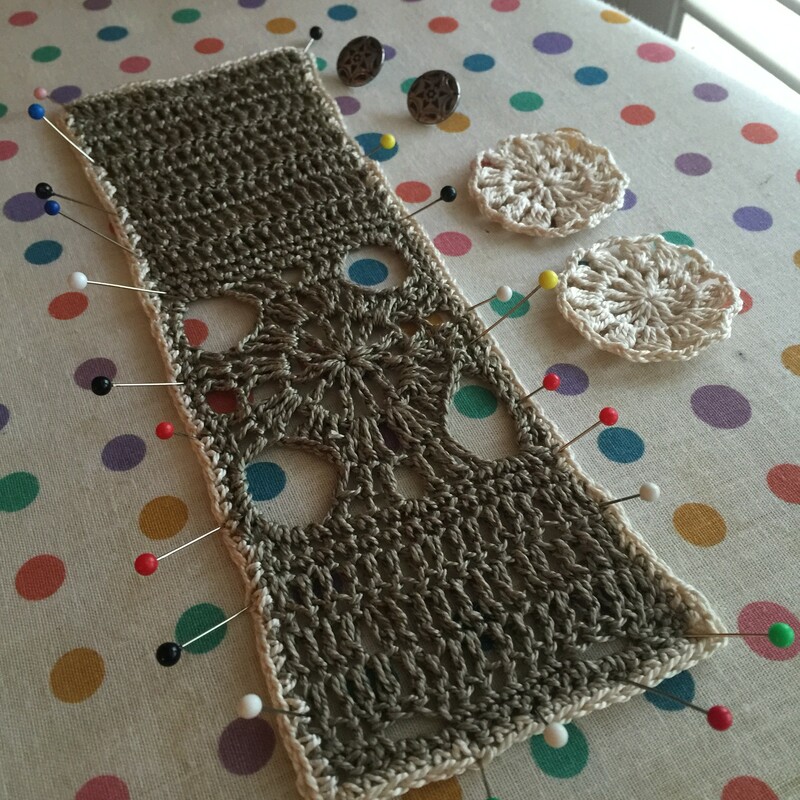 Join with a slip stitch into the first chain 3. 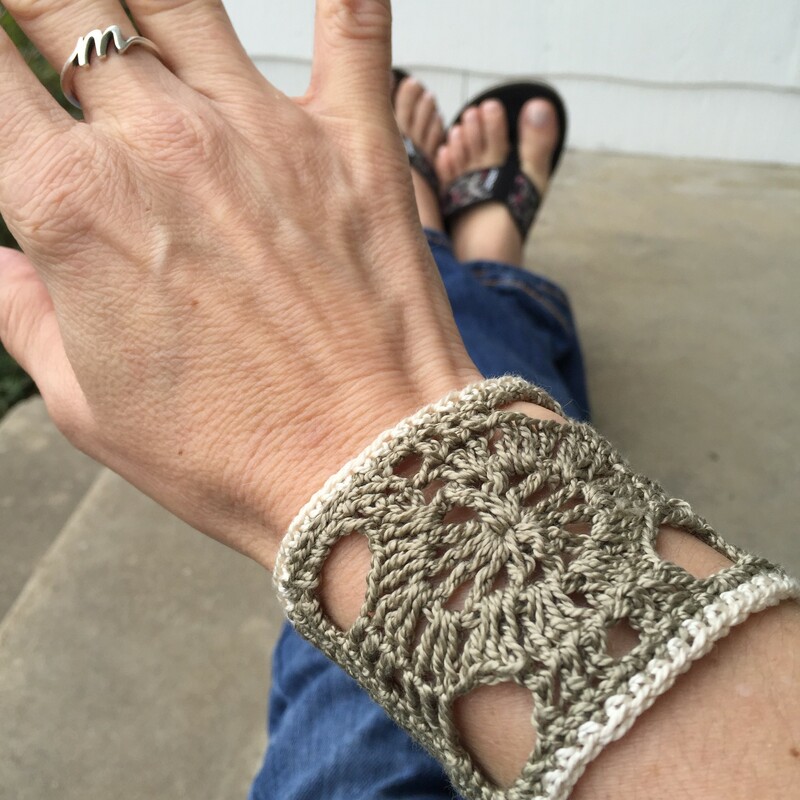 Cut thread and weave in ends. I dipped the earrings in some water and fabric starch and blocked them overnight so they would keep their shape. Then I dug into my jewelry supply box and found a couple of jump rings, earring hooks, and some other oval pieces to connect the earrings to. I really like how they turned out. 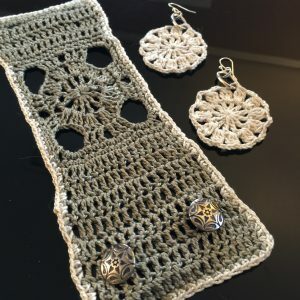 Besides looking great, these crocheted earrings are very lightweight. I hope you’ll give these patterns a try. Even if you don’t have a wrist tattoo. They are both pretty cool pieces to wear. And I bet you get a lot of compliments on them too. Marni Made It. You can too!